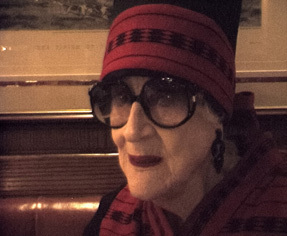 A film portrait of 94-year-old Zelda Kaplan in conversation Rina Sherman. Zelda speaks about her signature outfits she designs from Indian and African fabrics she collects in her travels throughout the world. She talks of chance encounter with Margaret Mead at the Museum of Natural History in New York that lead to her work in Human Rights and her fierce campaigning for women's rights around the world, specifically against domestic violence and female genital mutilation (FGM) in Africa. She also speaks of her life as a regular of Manhattan nightlife, often spotted dancing until dawn and partying with people under half her age.